At Lutes Custom Cabinetry & Furniture, you’ve discovered a truly custom cabinetmaker. We embrace the timeless tradition of handcrafted custom cabinets while craftfully blending it with favorite traditional styles, hot modern trends, or anywhere in between. And before we "finish," we'll find that perfect stain (or paint or glaze) to complete your project to your exact specifications. We specialize in complete kitchen cabinetry for new construction and remodels, bathroom cabinets & vanities, living room built-in cabinets & entertainment/media centers, fireplace mantels, and custom furniture. Look to us for one piece or your entire home or office. At Lutes, the very team that measures your project also builds, hand-finishes, and installs your fine cabinetry. Now that’s custom! Ready to begin? Give us a call @ 330.756.2326! "I enjoy cooking in an atmosphere where I am surrounded by fine craftsmanship created by a man that pours his heart and soul into his craft. Rick is not just a carpenter, he is an artisan. Rick’s meticulous attention to detail can be seen from the planning stage to the installation and the completion of the project. I highly recommend Rick and his team." Make sure to visit us at the 2019 Great Big Home & Garden Show at the IX Center, Cleveland. We are in booth 1199E and have some exciting displays to showcase. The event starts February 1st and runs through February 10th. See you there! Check out our latest blog! If you have a bathroom that's too small, we have some excellent suggestions on how to make it work for you. 2018 GREAT BIG HOME & GARDEN SHOW! Don't miss Lutes Custom Cabinetry at the 2018 Great Big Home & Garden Show February 2-11 at the Cleveland IX Center. We'll be located in Booth 1199E and feature the latest in custom kitchen and bathroom cabinetry for your new home or remodeling project. Happy New Year from your friends at Lutes Custom Cabinetry! See us at the Stark County Fair! Don't miss our booth at the Stark County Fair, now through September 4th. You'll find some great ideas for remodeling your kitchen or bath... or other areas of your home! THANK YOU FOR VISITING US AT THE 2017 GREAT BIG HOME & GARDEN SHOW! Thank you to everyone for visiting us at the 2017 Great Big Home & Garden Show. Let our experts design the perfect custom cabinetry for your space, whether for a remodel or new home. Check out our gallery for some of our latest projects. We look forward to hearing from you soon! 2017 GREAT BIG HOME & GARDEN SHOW! Come visit us at the 2017 Great Big Home & Garden Show February 3-12 at the Cleveland IX Center. Check out the latest in custom kitchen and bathroom cabinetry for your new home or remodeling project. Thank you for visiting us at the Great Big Home & Garden Show! Thank you for visiting us at the 2016 Great Big Home & Garden Show. In case you missed us or if you'd like to check out our booth again, we've included a few photos in our GALLERY. Better yet, give us a call to schedule your visit to our shop to see our facility, see our display up close again, and discuss your custom cabinetry needs! We would also like to offer a special "thank you" to show staff and promoters. For a second time, we were honored to receive the "Best of Show" award for our redesigned display! Lutes Custom Cabinetry invites you to visit our booth at the 2016 Great Big Home & Garden Show. The 2016 show runs February 5-14, 2016 at Cleveland's IX Center. If you are planning – or even thinking about remodeling or updating your kitchen, bath, or other cabinetry, you'll truly be inspired when you stop by and see our completely new display featuring beautiful custom cabinets! We are excited to add two new kitchen projects to our gallery and opening page slideshow! The trendy "white" kitchen features painted Maple with an off-white catalyzed conversion varnish. Note the recessed overlay doors and two-piece crown moulding detail. Accents and accessories include a glass subway tile backsplash, pantry with adjustable pullout heights, and granite countertops. Our other beautiful kitchen features Natural Cherry in the timeless Shaker style. Checkout the stone backsplash, integrated vent with custom-made stainless steel liner, Quartz counter tops, trash pullout, and Maple cutlery & knife blocks. Contact us today to begin your dream kitchen! It's closer than you think. Thank you for visiting us at the Great Big Home & Garden Show at the IX Center! Second Part of "Choosing the Right Countertop"
Check out Part II of our two-part series on choosing the right countertop, which we've added to our new blog, "The Sanding Block." Visit us at the IX Center for the 2015 Great Big Home & Garden Show Feb. 6th thru 15th! Check out our display of custom cabinets and furniture and talk to us about your kitchen or bathroom renovation or remodeling project. See you there! We are excited to release the newest feature on our website, "The Sanding Block" blog. Check out Part I of a two-part series on choosing the right countertop! special discount for any project booked in 2014! Plan ahead! We are offering existing or new customers the opportunity to receive a special discount IF you book your project by December 31st, 2014. Call for details! Thank You For Visiting Us At The Stark County Fair! Thank you for visiting us at the Stark County Fair! It is always our pleasure to meet new folks and discuss the possibilities of a dream kitchen, a new bathroom, or other cabinetry upgrades. Thanks again and we hope to hear from you soon! We've added some new photos to our gallery! Check out our latest projects that include custom kitchens, custom entertainment centers, and custom furniture. Plus, we've added quite a few cabinet options that you may find useful, including a tie rack, a kitchen island drawer (under stove), and a sample of the many types of glass door options available. 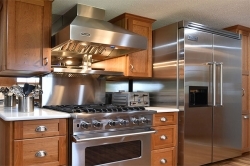 We would be glad to help you with your custom cabinetry needs. Give Lutes Custom Cabinetry a call at 330.756.2326, today! We had a great time at the Stark County Home & Garden Show. We look forward to following-up on our contacts and providing you with more information on our custom kitchen cabinets and more. Please make sure to visit our showroom or give us a call to schedule an on-site visit! Thank you for visiting us at the 2014 Akron Home & Flower Show! We are ready to help you with all of your custom cabinetry needs so give us a call today! Visit our display of fine custom cabinetry at the 2014 Akron Home & Flower Show February 28th - March 2nd a the John S. Knight Center. We'll also be the 2014 Stark County Home & Garden Show at the Stark Couny Fairgrounds on March14th, 15th, & 16th. We hope to see you there! A big thanks to all of you for visiting us at the 2014 Great Big Home & Garden Show at the IX-Center! Plan now to attend the 2015 show where we'll feature a new display of custom kitchen and bath cabinetry you are sure to love! Mark your calendars for February 7-15, 2015. Plan now to visit Lutes Custom Cabinetry at the 2014 Great Big Home & Garden at Cleveland's IX Center. The show runs February 8-16, 2014. We'll be in Booth #1364. A quick thank you to all who visited us at the (Canton) BIA Home & Garden Show this past week. It was an exciting show and we look forward to further discussions with many of you regarding your upcoming projects! And if we don't talk before, we'll see you again next year. We are displaying our kitchen and bathroom cabinetry this weekend at the Akron Home & Flower Show (John S. Knight Center)! The show runs Friday, Feb. 22nd, Saturday Feb. 23rd, and Sunday, Feb. 24th. Stop by our booth and take the first step in realizing your new kitchen, bath, living room...or any other room in your home! Thank you for visiting us at the Great Big Home and Garden Show! We were thrilled to have received the "Best of Show" award for our booth class. We displayed some of our fine kitchen and bathroom cabinetry that can also be seen in our home showroom. Stop by and visit us!